In the balance study below Ekstrand used a special hospital ward to measure every bit of fluoride that went in or out of each baby's body. Let's look at a graph derived from his study. We can see which kids are in a state of negative fluoride balance from following the existing fluoride schedule. This shouldn't be hard to guess, it is the infants getting no fluoride. The group 1 infants are getting breast milk and nothing else. In the new schedule, we will treat lots of children just like this group 1. There are no supplements given to ANY infants under age 6 months. So the only way they can get fluoride is to be using formula, and in such a way that mixes fluoridated water with it. All breast fed children will be in negative fluoride balance. In the last schedule it was fewer children, the children living with fluoridated water, but getting none of it because they were breast fed. We can also see which kids are over the threshold of fluorosis, also from following the schedule, and also not a surprise. 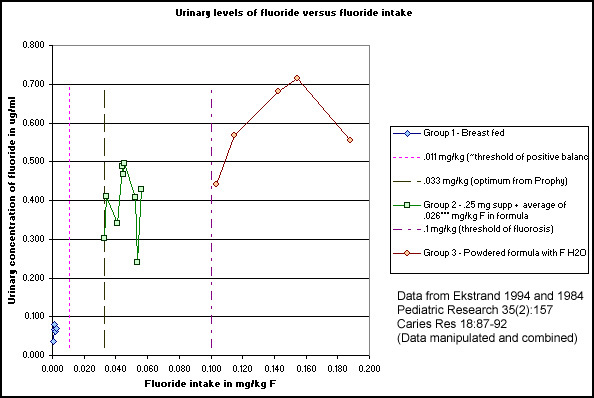 These are the kids getting powdered formula made with fluoridated water, group 3 in the graph. Group 2 is the closest to optimum, but they are a little high in my opinion. They are getting fluoride from 2 sources, either one of which would probably be fine alone. They are getting a .25 mg F supplement (these were 4 mo old infants, the average supplement dose was .041 mg/kg) AND fluoride in their formula of .026 mg/kg on average. Minor fudge factor alert: I calculated the food intake by the difference in total F (avg .045) and supp F (avg .041), to get one feeding's worth, and multiplied that times 6 feedings per day. That's where my .026 mg/kg from F in food comes from. I may be off, but note that as a group these guys are a good bit higher than would be expected. That is, if you drew a line from group 1 to group 3, it would go under group 2 instead of through the center of it. The intake that is given and plotted is just from the 1 feeding, not from the rest of the day. But I think their urine shows the effect of their daily intake. Group 2 would fit the graph better if you scooted them over to the right by about .02, which is about the food F intake not given and plotted.